Oxford is a city of 150,000 people. 30% of adults cycle at least once a week, and 20% cycle to work. It has a fairly well-established cycling culture. It has achieved this with mostly low-cost infrastructure. Across the table above, cyclists are divided into a number of types. Child cyclists are broken down by approximate age-group (assuming they are accompanied). There is a separate category for solo cycling by the 11-13 age group – a critical group in the UK, since this is the age when children go to a larger secondary school, typically further away, making cycling very important. The adult cyclists are in four groups based on UK Department for Transport research. The first group (scared) don’t want to cycle on main roads; they will cycle on pavements and use crossings, but not on main roads. The second group (careful) will cycle on main roads, but only if they can stay to the side. They don’t generally look behind, don’t like pulling out around parked cars or to turn right, and hate UK-typical fast roundabouts. The third group (skilled) look behind, are much more aware of the traffic around them, and can handle right turns and roundabouts. The fourth group (wild) passes cars on the inside or outside, rides on the pavement, and doesn’t care too much about obeying traffic rules. The observation in Oxford is that – in an established cycling culture – the biggest group of adults are “careful” – an estimated 75% of the total. They do use main roads, but they don’t tend to look behind them, and avoid pulling out to make right turns in free-flowing traffic. This group is often ignored, and is often much smaller (in less-developed cycling cultures), but they are a critical group to understand. So what type of infrastructure allows this group to cycle? Looking down the table, there are a range of types of infrastructure. For comparison, Dutch-style cycle tracks (with segregation at junctions) work pretty much across the board. But creating such infrastructure is expensive. Danish-style tracks (with integration/close-proximity) at junctions works for most age groups, though perhaps not for the youngest. Again, this is pretty expensive, and hasn’t been used in Oxford. Instead the main provision on Oxford’s main roads are painted cycle lanes and bus lanes. There are two aspects that seem to have made this work: firstly that traffic speeds have generally been brought below 30mph (50kph), and secondly that bus drivers are trained not to intimidate cyclists. In a few situations where there are significant volumes of traffic turning (left) across the cyclists, the cycle lane has been painted across the junction, to emphasise to the driver that they are cutting into the space for cyclists, and should behave accordingly. One major roundabout at the eastern end of the High Street has been treated using “Swiss” techniques to reduce traffic entry speeds. Looking at how these techniques work for the different types of cyclists, they seem to be adequate to enable the careful adults to cycle, and older accompanied children. 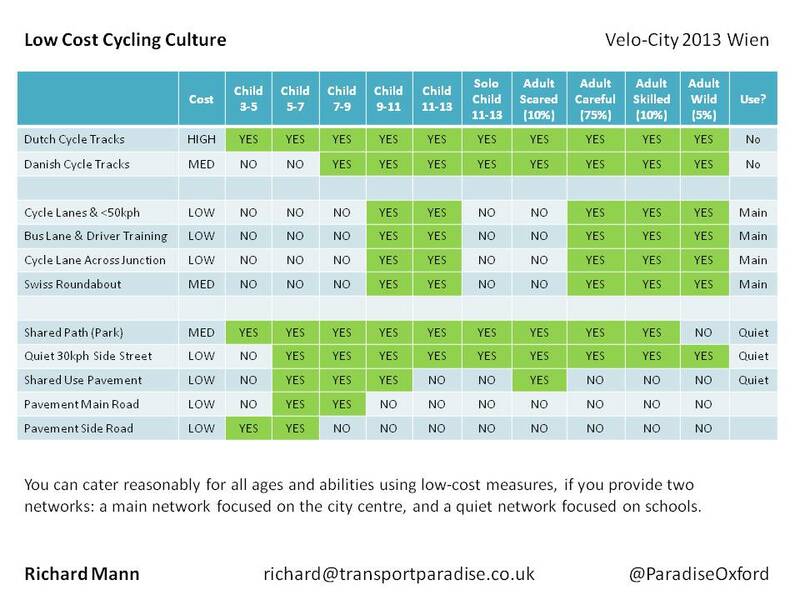 However this leaves significant gaps, and we would not have a workable cycle culture if those gaps remained. So we have also made a separate network of facilities using shared paths, for instance in parks, quiet streets (all 20mph/30kph), and where necessary a shared-use main road pavement (typically fairly narrow, and giving way at each side road). This network, focused on schools, fills the main gaps, and in particular provides for 11-13 solo cycling to secondary school. Coupled with some (technically-illegal, but nobody cares) cycling on pavements by younger children, this covers the full range of cyclists. Find out more about the the ways cycling changes as children develop, or the different types of adult cyclist.